Please contact us for our seminar schedule. PORT TOWNSEND - A new group in Port Townsend is helping people go "green" when building new homes. The Rainshadow Green Design Team was established about a month ago and is dedicated to spreading the word of the benefits of sustainable building. 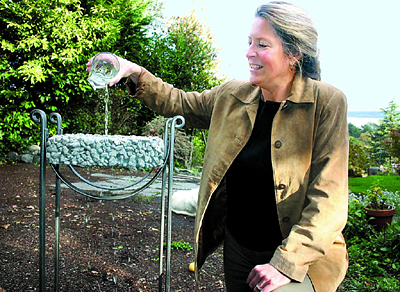 Ann Raab, who owns Port Townsend-based Olympic Design Group, has already been working toward building sustainable homes. She recently joined efforts with two other local women. Marilyn Brasier, an interior designer and decorator, and Holly Mayshark, owner of Holly's Fine Flowers in Port Townsend, will work with Raab to offer consulting and design services to those interested in "building green." Raab's expertise is in the external structure of a home. Brasier will do the internal design and Mayshark will concentrate on the landscaping. "Our mission is to educate people on what it means to be sustainable," said Raab. "It's about being more in tune with the environment." She said because of energy issues, sustainable building is becoming increasingly important to minimize energy consumption and diversify the sources of energy. A true green building, Raab said, uses the environment, such as the sun for heat and shade from trees for cooling. The materials that go into the construction of homes are also important, she said. Her office, which is attached to her home on Morgan Hill in Port Townsend, is packed with samples of ecologically friendly materials These include insulation made from recycled blue jeans, a vast array of cork surfaces, boards made from agricultural materials and permeable concrete. Raab said homes are being built larger, on average, than they used to, which is not energy efficient because it takes more to heat and cool. "It's better to minimize structure size and optimize usable space," Raab said. Rainshadow Green Design Group is still in its infancy, and with Brasier visiting Japan during much of November, the group won't be in full swing until after the first of the year. Raab said the group will provide classes and private consulting to dispense information about sustainable building. 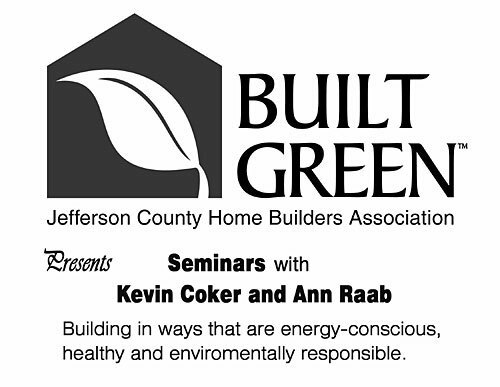 Raab currently has some sustainable building workshops scheduled with Kevin Coker of Coker Design Works in February 2007. The workshops will take place every Tuesday and Thursday that month. For more information about the workshops or the Rain-shadow Green Design Team, phone Raab at 360-385-5614. Web site design and photography by Acies Communications.